Bet 365 is a big name in the online gaming industry and now gamblers have more choices with Bet 365 Bingo. Experts in the gambling market, they have added another stellar gaming resource. It’s a name you can trust and games you will love. The bingo balls have come to life in human form and bingo heads at Bet 365 Bingo. After you join you will become part of the bingo head community. The Web design is in rich tones of plum and has a look of elegant sophistication. Explore the site further by visiting them on Facebook, Twitter and YouTube and get your daubers ready for exclusive offers. The Winners page has eye popping bingo head winners with huge Progressive Jackpot wins. 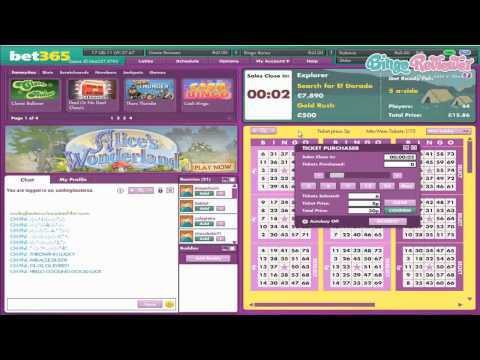 If you are new to bingo and a bit shy to join in the chat room chatters because you are not quite sure of the language, worry no more. Go to the Chat Lingo page for a comprehensive list of detailed abbreviations. Before you know it you’ll be coming with some fancy bingo lingo yourself. Bet 365 Bingo includes there other amazing sites. Click the tabs to Poker, Sports and Casino for all your gambling needs. You can be certain they are fully licensed by the Gibraltar Licensing Authority and regulated by the Gibraltar Gaming Commissioner. This is a bingo portal that goes the extra mile in bringing players a large selection of bingo games. Feel what bingo freedom is like with 90 ball, 80 ball, 75 ball, DOND bingo and Spanish Bingo. Some very old fashion favorites and some new ones too. Multiplayer Slots gives players the same interactive fun as the bingo room do. Mingle with other bingo heads while spinning on three different slots to choose from. You’ll find some of the most contemporary slots in the online bingo industry that players have made very popular by demand. Instant Win games are a lucrative way to win big cash like one lucky bingo head did winning a unbelievable £3.9. If you would like to win an instant Jackpot there is a wealth of Scratch Cards to choose from. The massive variety of gambling options is incredible. Big Jackpots and Interactive Slots make this site extra special as well as a large selection of bingo variations. We rate Bet 365 Bingo with 4 Pink Hearts. I must admit it is nice to play bingo on a site that is not pink! The chat moderators are really good and the deposit bonus ius 200%. I first signed up at this site more than a year ago, and I still visit it. One of the reasons behind that is the great graphics, but what really gets me to go back is their promotions. I guess there is an advantage when you deal with established companies like Bet365. Admit it, this might be their first foray into online bingo, but they really have great promos, and their design is eyecatching. And then there is their world class customer service. It is clear that whatever they learned from their other businesses, they brought it here. Though game prices are kinda steep at 50p, they do have great jackpots which kinda justifies these prices. And you can still catch games where game tickets are old at only 5p. This is one of the few sites to offer a refer a friend programme, and I really love how they reward you and your friend just for being on the site. I think that they have a great layout where you can see all the information you want to know about. What is more, I really like their big jackpots here. Bet365 Bingo is a famous and popular site and it would be nice to see some more current reviews. Being from the US, I can't play here so I can only offer my opinion based on the site's looks and the offerings and promotions. This isn't so bad though as it's obvious up front why this site is such a standard of success in the online bingo world. They have interesting bingo head people for mascots, which is a little strange but then you see the humor and fun in it and it all evens out. They have a long list of promotions so you know the opportunities for strategizing your wins are immense. If you like to play for the jackpots you will never run out of fun at Bet365 Bingo. They also run a nice loyalty program and their website is easy and fun to navigate. You can use the filter to find games that are suited to your monetary needs, so that's a big plus in saving time and not missing out on a great game just trying to find out where it may be. With other games than bingo, like the sportsbook and the great casino games they offer, you will be entertained as well or better than at any other bingo online site. When all bets are in, Bet365 comes out a winner every time! I really like the layout here. There are lots of colors going on, making it very appealing to the eye right off the bat! I also like that they have their bingo rooms listed right up front and you can always see what time the next game is starting. Signing up to the site was very easy and I was able to begin playing in no time at all. They start you out with a welcome bonus that is pretty standard. It wasn’t the best I have seen but it certainly was not the worst either! When you sign up and make a minimum deposit of £10 and buy at least £10 worth of bingo tickets, they will give you an additional £20 free. They have lots of fun and exciting promotions at the site to engage in on a regular basis. Just take a look at their ‘Promotions’ page and you won’t believe your eyes! The bingo site is a part of the larger Bet365 Network, so you should know it is operating for quite some time, with a pretty large base of players. First thing that I have seen is that the site has a very interesting design, definitely far from the average casino site that you can find online. The layout is very clean and user friendly, and you will be able to find everything you need in just a few clicks. Although they use Virtue Fusion software, they have done some customizing, so it is not identical to other VF sites that I have played on before. When you sign up, you get 200 Bingo tickets to play with, and then when you deposit and spend £10, you get another £20 to play with. So, it is really a good starting offer. I was impressed with their Bingo offer, with 75, 80 and 90 ball games and a huge number of available rooms. Easily one of the best Bingo places I have seen so far.